Were you with us when we examined the case for Bi-Metal pump shafts? 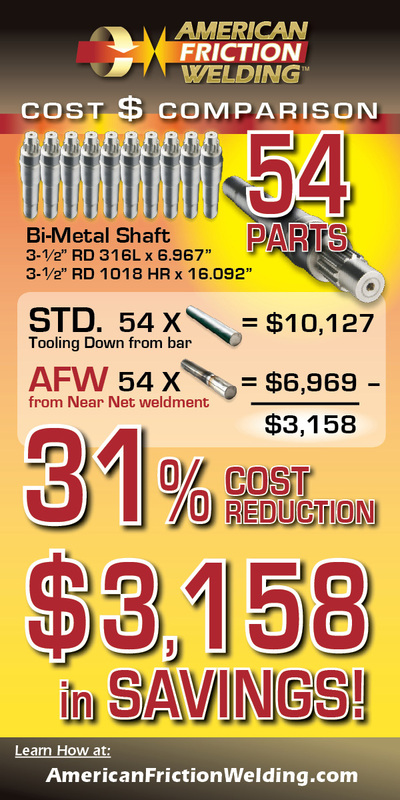 The evidence is conclusive that bi-metal pump shafts offer significant cost savings. 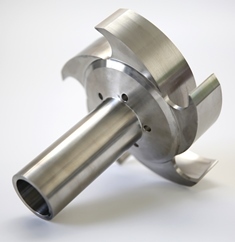 Now we have a claiming big savings when using Near-Net blanks to make solid alloy pump impellers. How is this possible? The savings in this process are achieved by starting with less material. There is less material to buy and less material to remove in the machining operations. In an industry serving users of non-porous, non-corrosive pumps destined for chemically harsh, wet working environments expensive alloys are in constant demand. Would reducing your consumption of those alloys improve your business model? If a solid, non-porous, non-corrosive pump impeller is required, the common approach is to cut it down from full-diameter solid billet. Castings are prone to porosity, so count them out of the picture. Forgings are uncommon because the quantity volume generally is not present in the niche-oriented pump market. 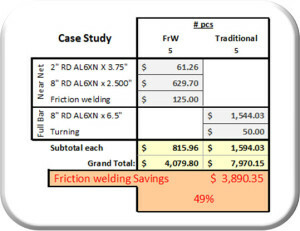 Friction Welding is the approach to provide a Near-Net shape without the volume constraints and lead times of forgings. The components are made from solid billet to address the non-porosity requirement. What about the weld zone? It is a solid, non-porous, non-corrosive fusion of material with all the strength and machinability of the parent components. The finished impeller (above left) was made from a Near-Net blank. This animation illustrates the common approach with CNC lathe turning. The wasted material and inserts were consumed in the reduction of a full-diameter bar to a near net shape. Eliminate all this waste with friction welding. The difference is a saving of $778.07 per piece or 49% of the single piece version. On the 5 piece order in this case that adds up to $3,890.35 per lot by simply reducing the amount of material used in this very small quantity lot. Next time, we will look at impellers made from more common stainless steel alloy in higher volumes.